I’m standing on the end zone line with six of my teammates in the national championship game. It feels like butterflies are racing the Kentucky Derby in my stomach. The smallest drop of sweat starts to form at my brow. All the preparation, long hours of practicing outdoors in the Oregon rain, not being able to tell what is rain and what is sweat, the 5:00 a.m. wake-up calls for morning lifts in the gym or weekly track workouts come down to this one game. I look to my right and see my parents in the crowd. My mom looks even more nervous than I do, but my dad has a calm demeanor about him as he gives me his signature point and fist pump. Across the field stands the only thing in our way of becoming national champions, the only team that could reduce our gold to silver, the only team left on our to-do list: Stanford. One last time, the announcing ceases. One last time, the camera operator signals that coverage has started. My final game as a college Ultimate Frisbee player has begun. The pull goes in the air and I sprint down the field. This is the game of Ultimate Frisbee. Rewind five years to my first steps on campus. I came to the University of Oregon as a shy 18-year-old who didn’t know anyone and who would rather hang out in her claustrophobic dorm room on a Friday night than go out wandering the streets searching for a party. Don’t get me wrong, I am a very kind and social person, but starting over in a new city can be hard at times. So I waited patiently for something to change. I had always played a sport growing up. More than merely an activity, playing sports was a lifestyle. It felt as though sports were the foundation of who I was supposed to be. Yet, when I arrived at college I didn’t know that Ultimate even existed. I remember throwing what seemed like a dog disc on my parents’ driveway with my dad, but never thought it would be developed into a sport. Little did I know that it already was one. One evening after youth group, while playing what would be my first “game” ever of Ultimate, one of the leaders suggested I “hang out with these girls” on Mondays and Wednesdays at the Riverfront Field from 3:00 to 5:00 p.m. So I did. This would be the greatest decision I would make in college. I showed up the next Monday in my running shoes, which was a poor decision, but they were all I had. I got to throw, meet a ton of interesting people, run around like a chicken with its head cut off, and realize that I was so bad at it. But for some reason that I still can’t fathom, I wanted more. On Wednesday, I traded my running shoes for a pair of soccer cleats, and from then on it was game on. 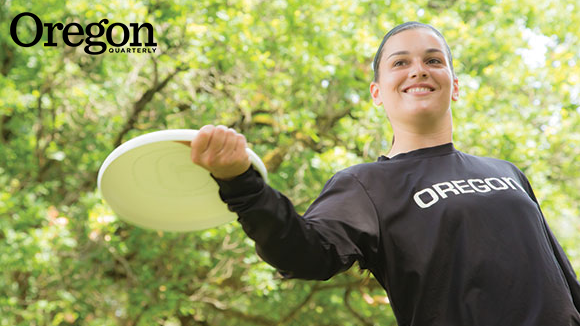 Ultimate Frisbee is a dream come true for those who want a sport that requires the speed of the Oregon Ducks football team, the quickness of Allen Iverson’s deadly crossover, and the finesse of Abby Wambach scoring yet another magnificent header in the World Cup. The field is set up like a football field with two end zones separated by 70 yards of grass. The pace of the game is similar to that of soccer, where the first team to score ends the point. There can be several possession changes throughout a point if the disc is dropped or intercepted. The disc can travel forward, backward, upside down, and pretty much any other way you can think of. However, as soon as you catch the disc you must establish a pivot foot similar to basketball. Because the goal is to throw the disc to one of your teammates in your end zone, you must channel your inner Marcus Mariota to make the right decisions. On any given point, our go-to offensive play includes four of the seven girls on the line. Lillian catches the pull and centers the disc to Hayley. Meanwhile, the other five girls are lined up on the side of the field ready to get involved. When Hayley catches the disc center stage, Jesse breaks free from the sideline and sprints across the field, leaving her opponent in the dust. As soon as she catches the disc, Olivia sprints downfield on a mission into the end zone. As soon as one receiver catches the disc, she then becomes the quarterback. Our coach, Lou Burruss, has been part of the sport since 1990. He has been coaching at the University of Oregon for eight years now. In those years, he has led the team to three national championships and five title game appearances. Not too shabby. Our team name is not the Oregon Ducks. It is Oregon Fugue. Fugue is a musical composition of melodies and short phrases that come together to produce music. We aren’t the Ducks because Ultimate is at the college club level, not varsity. The funding we get from the University of Oregon is limited, meaning we have to raise money for travel and food, and we sleep on the floors at the homes of host players when we go to tournaments. The community aspect of Ultimate is something that I have never witnessed before in any other sport. Throughout the year we travel to several tournaments, leaving early on Friday and arriving back in Eugene by midnight on Sunday. Teams from all over the country travel on these weekends to play other teams they don’t normally see in their respective regions. Typically, we play as many as seven games in a weekend. There are about 20 teams at each tournament. From the beginning of the school year to the end, we prepare in the best way we can. This preparation leads to the national tournament held during Memorial Day weekend, where the top 20 teams in the country fight for the gold. What sets Ultimate apart from any other sport is what is called Spirit of the Game. If you ever watch a game of Ultimate, you will notice that there are no referees in their typical black-and-white striped shirts with whistles at their lips. In Ultimate, there are simply “Observers,” who come into the picture only when a dispute between two players cannot be resolved. The game is in the hands of the players. Each player calls his or her own fouls and is then forced to communicate and resolve the conflict with the opposing player. During the national championship game against Stanford there were several instances in which questionable calls were made and players had to communicate with one another to get the play started again. It is more than just another sport. You don’t have to have the disc skills or talent to be successful. Ultimate has led me to be a better version of myself. Throughout my five years playing and establishing myself in this community, I’ve learned that I can raise my hand in class, hold conversations with the grocery store clerk, and work hard at something I have never done and be successful at it. It all came down to a single game. Throughout the season, it was our goal to win—plain and simple. The path to get there, however, was not laid out for us and was constantly changing. Every season is different. But there was something about this team. We were up for the challenge even though, as the number one team in the country, we had a constant target on our backs and had to face our biggest opponent, ourselves. When I saw that initial pull go in the air for the first point of the national championship game, all the worry and anxiety rushed out. I remembered our first fall practice out at the Riverfront Field complex in Eugene; I remembered making our team, but most of all, I remembered the first day I laced up my cleats and began to fall in love with Ultimate. At the end of 85 minutes, we were victorious. It was a perfect, messy and windy, play. Beth to Olivia to win 13–11 over Stanford University—a team we were longing to see in the finals. I felt overwhelming relief and Ultimate joy. Ashley Young, BS ’15, graduated in June with a bachelor’s degree in journalism.